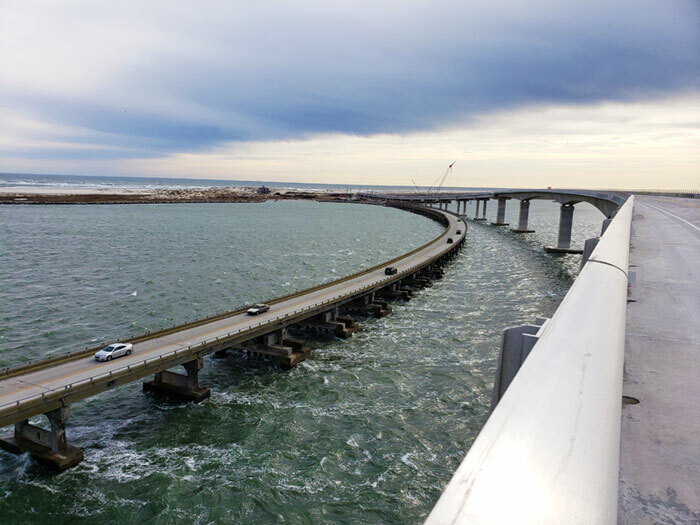 Hundreds of Dare County residents and visitors braved the cold temperatures and rough winds on Saturday morning to celebrate the completion of the new Oregon Inlet Bridge. Though not officially open to the public just yet, the bridge was temporarily accessible on Saturday for pedestrians and cyclists who wanted to walk along the newly finished structure. The event officially began with a ceremony in a covered tent on the edge of the northern bridge terminus. 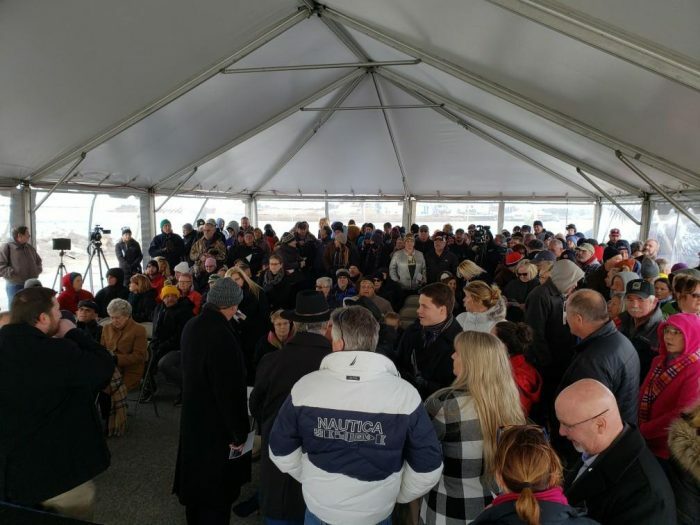 A crowd of attendees huddled inside the tent, and more people hovered outside, as local and state representatives paid tribute to the individuals and organizations that played a role in making the new bridge come to fruition. “Today proves that dreams do come true,” said keynote speaker and Dare County Commissioner Chairman Bob Woodard. “This has been a dream for so many years, and for so many people. Woodard noted in his remarks that the original Bonner Bridge – which was built in 1963 for a cost of $4 million dollars – had passed its intended 30-year lifespan 26 years ago. But its replacement, which was built at a cost of $252 million dollars, was designed to last for 100 years. “I don’t expect to be around for the next go around, and I don’t think you’ll be here either,” he joked with the crowd. Cape Hatteras National Seashore David Hallac also spoke at the ceremony, commenting on the size of the assembled crowd. “I guess we should have charged for parking,” he joked. Hallac talked about the history of the original Bonner Bridge, noting that Congressman Herbert C. Bonner had stated in 1948 that the establishment of the National Seashore was “The greatest thing that has happened in our lifetime in Dare County and Eastern North Carolina,” and that Bonner understood the need for a bridge across the inlet years before it was established. 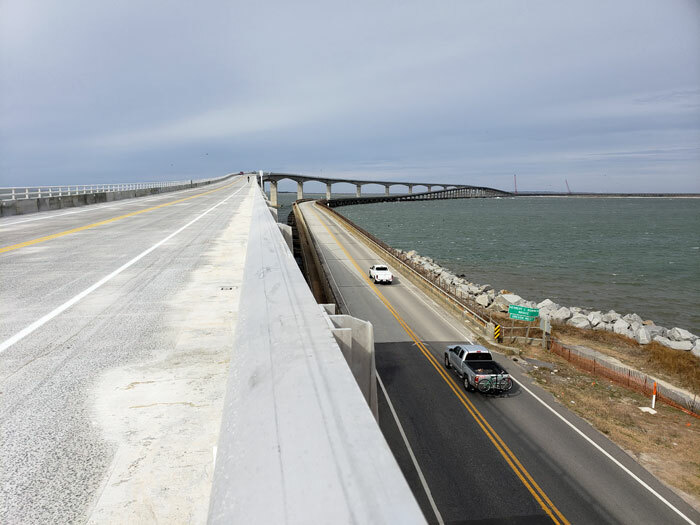 Hallac also spoke about the construction of the new structure, which would provide a smooth ride and safe travels for the more than 2 million people who cross Oregon Inlet every year. Natalie Kavanagh and Beth Midgett, the driving force behind “Bridge Moms” and the local island efforts to build a new bridge for decades, also spoke to the crowd, and thanked everyone who had joined their initiatives. Malcolm Fearing, former state transportation board member who also assisted with replacement efforts along the way, thanked the construction crews who had worked hard for nearly three years, in all weather conditions, in order to arrive at this day. 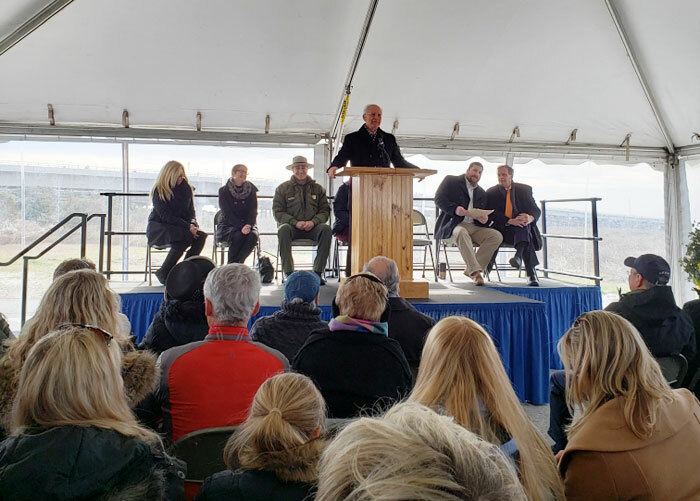 The weather was seemingly no deterrent for visitors eager to celebrate the bridge’s opening, however, and multiple people in attendance at the ceremony stated that they traveled long distances to come to the momentous occasion. 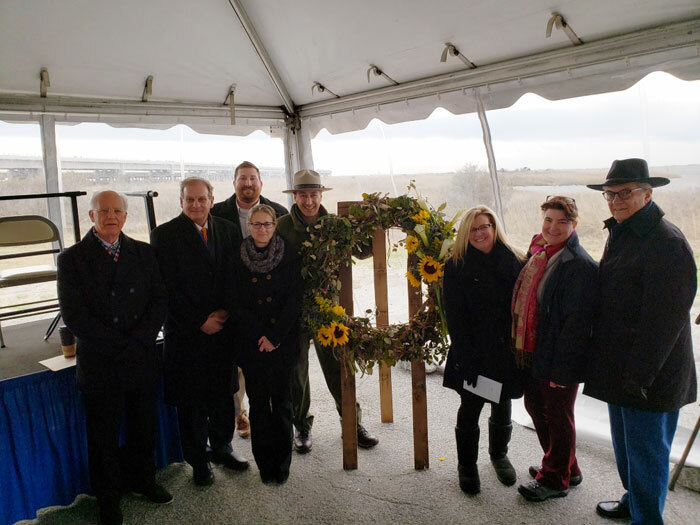 Other county and state representatives at the ceremony included all Dare County Board of Commissioners, N.C. House Representative Bobby Hanig, NCDOT and National Park Service representatives, and Margaret Daniels, the daughter of Capt. Toby Tillet, who provided the first ferry access to Hatteras Island across Oregon Inlet more than 50 years ago. After the ceremony, the crowd made the short walk to the edge of the bridge, where hundreds of people shuffled their way on foot and on bikes through high winds to explore the structure. Vans were stationed along the way to help folks complete the crossing – as the 15-20 mph north winds made the walk back much more challenging – and everyone grinned against the wind as they took pictures and marveled at the inlet views. At 2.8 miles long, the bridge was certainly large enough to handle the hundreds of visitors, and even with the typical rough winter weather, the mood was one of celebration throughout. The new bridge towers over its predecessor with a top height of 90 feet. Photo by Don Bowers.